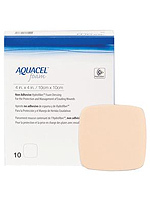 Aquacel Non-adhesive Gelling Foam Dressing 4" x 4". Water proof bacteria barrier, soft absorbent pad. Interface gels upon contact with the wound exudate with creates a moist wound environment. Made with a gentle silicone border which is skin friendly.